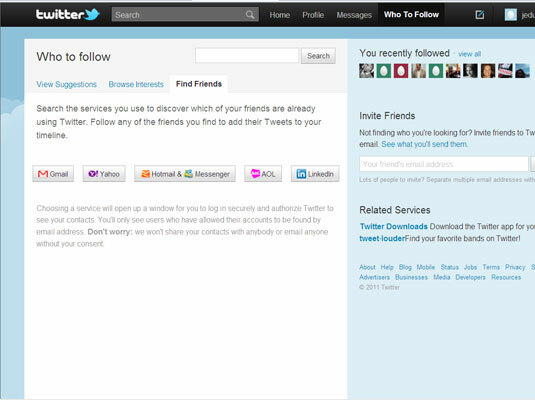 You can find your friends on Twitter by importing contacts lists from other services — such as Gmail, Yahoo! Mail, AOL, and Hotmail — that you already use. Twitter will let you know who among your contacts are already busily tweeting away as registered Twitterers. Click Who to Follow at the top and then click the Find Friends tab. You’ll see five different account choices. Select the account type from which you want to import. Having Twitter automatically find your contacts involves entering your e-mail account password. Although Twitter has established itself as a trustworthy service, in general, be cautious about sites that ask you for your e-mail address and password. Type your credentials and password and click Sign In. You’ll see a button that says Grant Access, Allow, or something similar. Click it, and Twitter looks at your contact list and gives you a list of all the people from your address book who are already on Twitter. Select the check boxes for the people you want to follow. If you click the Select All check box, everyone is selected. If you uncheck the Select All check box, everyone is unselected, and you can go through your list of contacts, picking and choosing who to follow. When you finish selecting people, click the Continue button. If you didn’t select all the people in your address book, you’re asked whether you want to invite any of the people you didn’t select to join Twitter. If you’re a Twitter newbie, the answer is probably “No,” but the choice is yours. If you’re not careful about where you click when you invite contacts to join you on Twitter, you can accidentally send an e-mail to everyone in your address book. However, if you want to invite all your contacts to join you on Twitter, go ahead, and share the Twitter love! Repeat these steps for your other networks, if you have them.